Ever since we planted the grass seed in the top field, it hasn’t stopped raining. It has only been light rain, but it has been going on and off for a day and half. This is ideal for the new grass seed, but not too great for local events. The top field is now re-seeded! 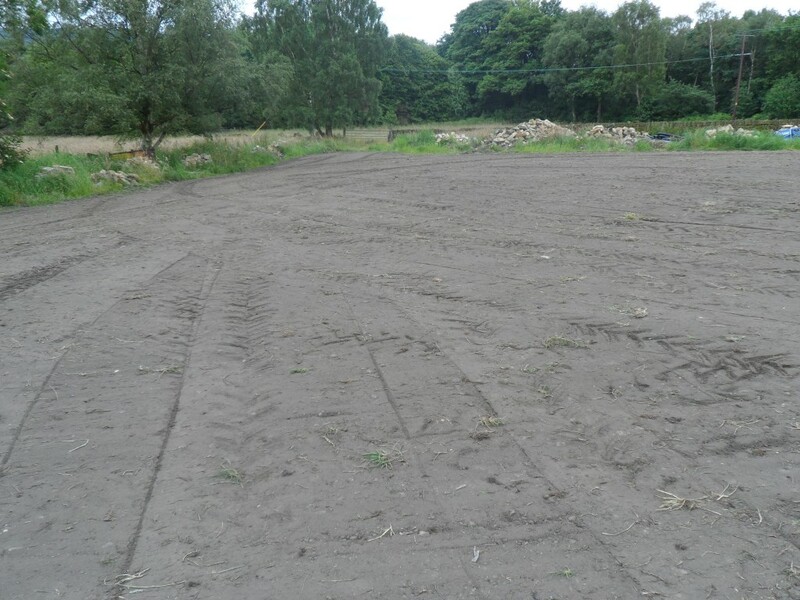 Well, we eventually got there yesterday and the top field has now been re-seeded. Just as well, since the weather has turned wet today. 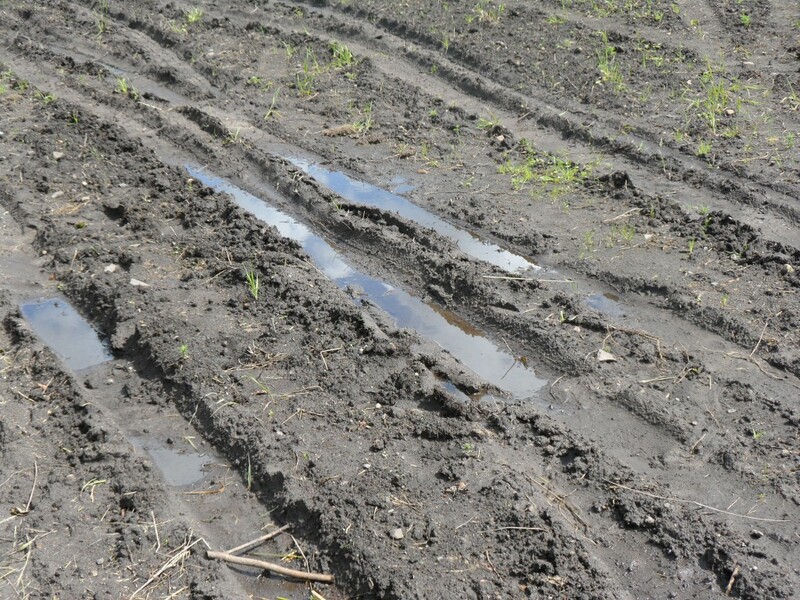 In fact, the wet weather was exactly what we did now that the seed is down. We re-harrowed the field. This means raking it over with the tractor. Unfortunately, even more stones came to the surface, but these were quickly picked up and thrown to the side of the field. 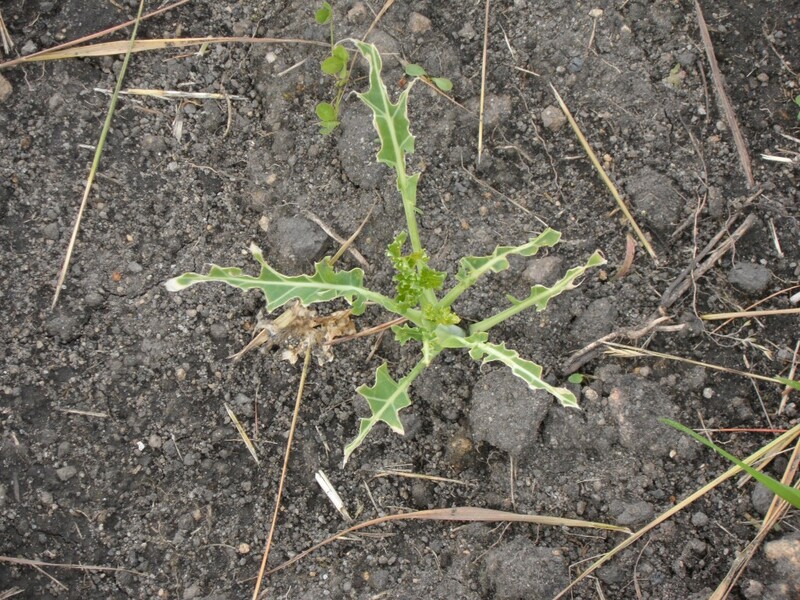 It also pulled up the weeds and wild grass that seemed to be taking hold. Next job was to used a seed drill on the back of a tractor to bury the seed just under the soil. This prevents the birds getting to it. We ran the seed drill across the field both horizontally and vertically to make sure that it was all covered. And just in case anyone is interested, we sowed the seed at 14Kgs per acre. The last job of the day is then to roll the field flat with a heavy roller. Apparently, the more the ground is rolled, the faster the seed will germinate. The end result looks fab and with any luck we should see some grass starting to germinate this time next week. Fingers crossed. 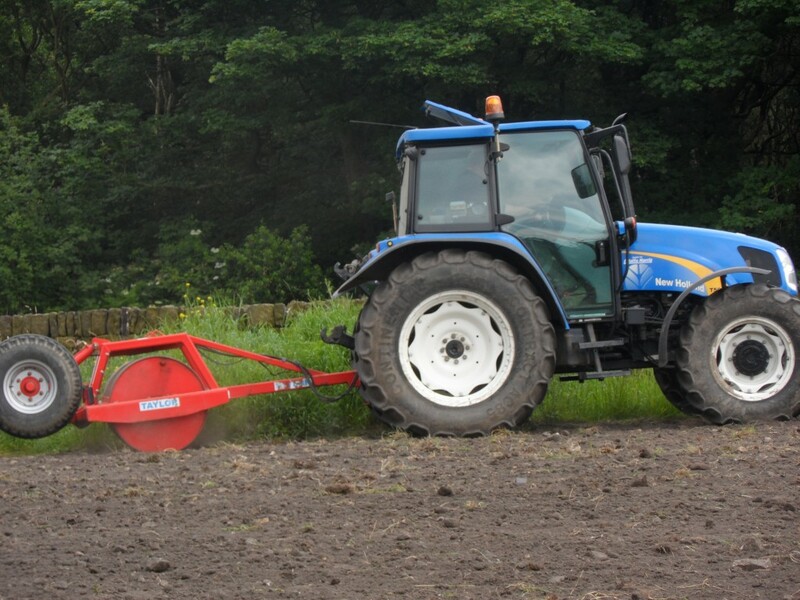 This is a seed drill used on the back of a tractor to place the grass seed under the surface of the soil. We made two runs across the field – one horizontally and one vertically. This makes sure we get the best spread. Once the seed has been drilled into the soil, it is then rolled. Apparently, the more the soil is rolled the faster the germination. It will also keep deter the birds slightly. Once the field is rolled, the finish is not too bad. Not bad for a field, not great for a bowling green. With any luck, the seed should germinate in about a week. 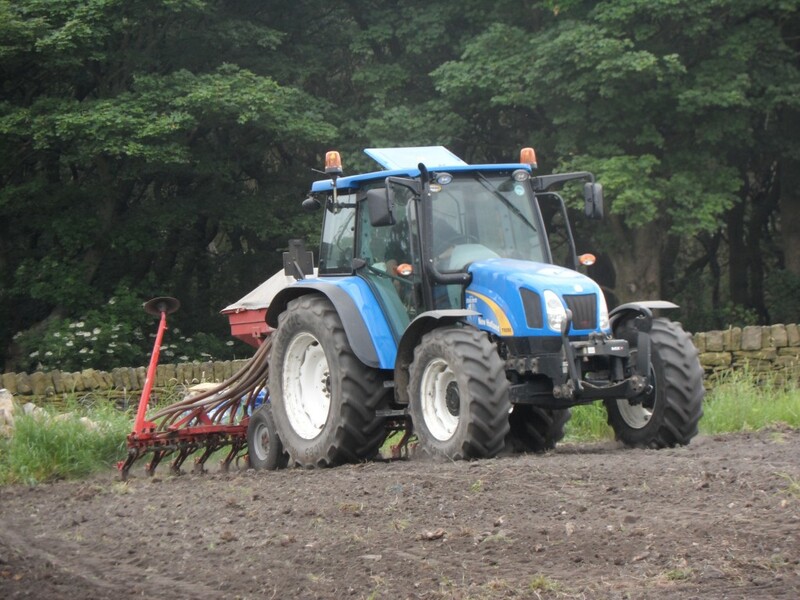 All of the rain that we have had recently means that it has been too wet to reseed the top field. The wet weather did mean that it was easier to pick up all the stones, but now we are waiting for it to dry out before the farmer can return to reseed it. While it is too wet to sow, it is great grass growing weather. All in all, we spent probably 3-4 days picking stones out of this field. 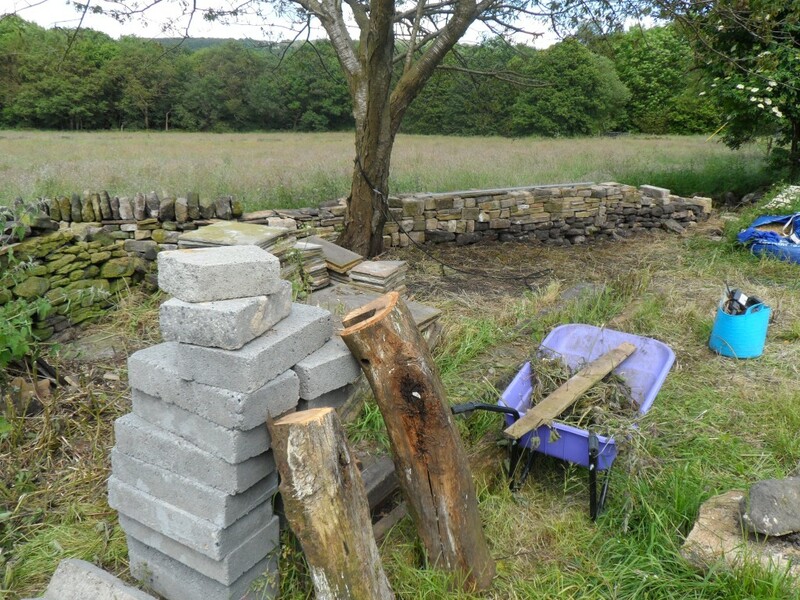 Much longer than I thought, but now that we have restarted on the dry stone wall, much of this stone will be lost in the new wall. We have had a lovely sunny day here in Yorkshire today, so hopefully, if it remains like this, we will be able to reseed the field next week. We picked as many of the stones out of the top field as possible, but the rain has meant that it has been too wet to reseed. This is a shame since (ironically) it would be good growing weather for grass! 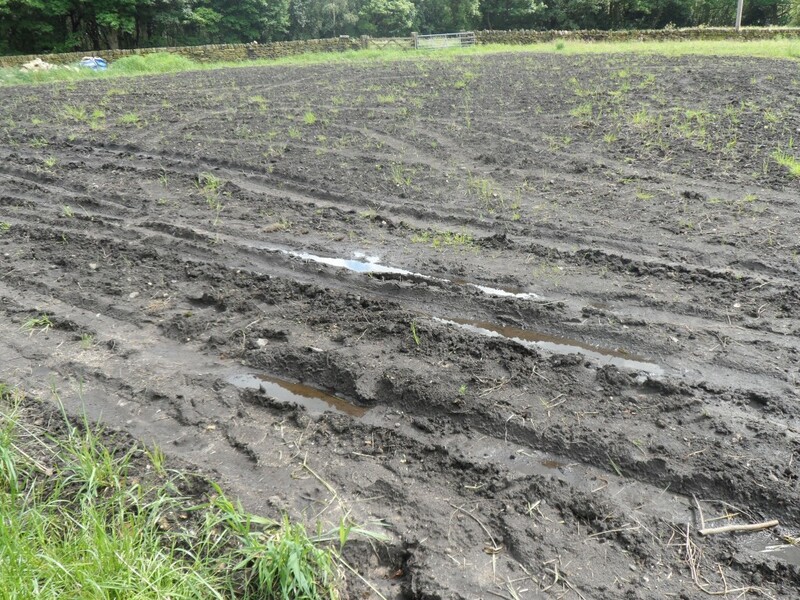 There is standing water in much of the top field. If nothing else, it means the dog brings most of it into the house once he has been out running around! He often doesn’t remember to wipe his paws on the mat. 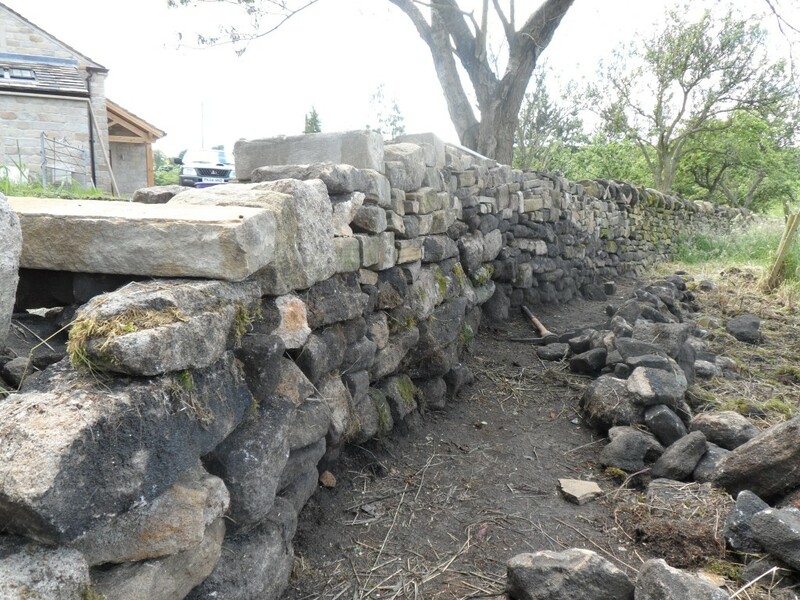 We completed the dry stone wall in the orchard last year. Now that the builders have gone, it is time to start extending the wall (or rather re-building the wall) along the edge of the top field. Not only will this tidy things up a bit, but it will also help us get rid of some of the “spare” stone that we have in the top field. The “spare” stone made up part of the old toilet block and barn that we demolished to make way for the new extension. The first job is to clear away all of the undergrowth in this part of the field. This is where a petrol strimmer comes in handy! Then it is a case of taking the old wall down to a level where we get on to something solid that we can build off. There are a number of large trees along this wall line and this makes life a little harder. There is no point in trying to dig the roots out – we would be there forever and we would probably end up damaging the tree. You have to work with what is there and this can mean that the line of the wall is not as straight as you might like. You have to work with the trees and their roots. It has taken us about three days to clear and re-build a 20ft section of the wall. As always, it looks terrible until you are just about to put the topping stones on (and then it looks OK). This section of wall bends around from the orchard to from the edge of the wall in the top field. You can’t use string to line up the wall here, so it is all done by eye. The roots from the trees also mean that digging the foundations can be difficult. In some places, we have had to follow the line of the old wall – even when it wasn’t straight! 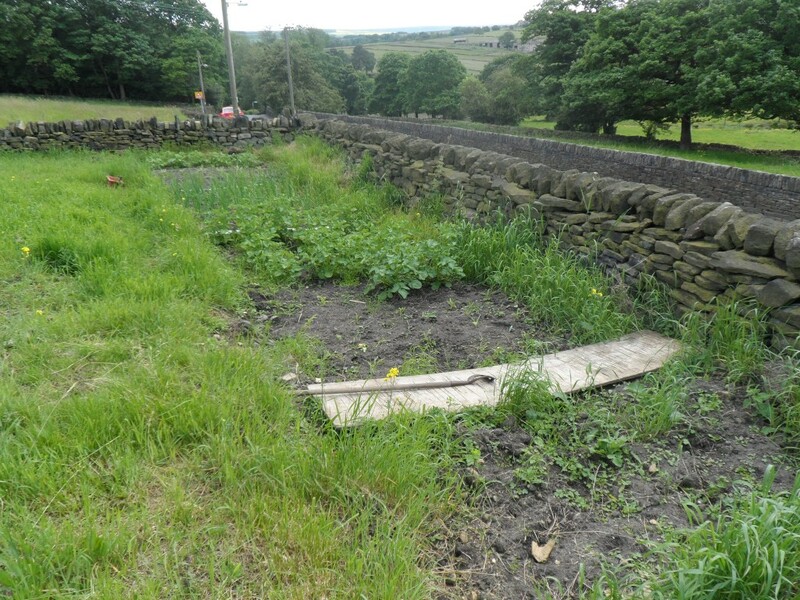 Now this corner of field has been cleared, we can get on with rebuilding the dry stone wall along the edge of the top field. The vegetable patch seems to becoming on in leaps and bounds. No doubt due to some of the (very) wet and (slightly) sunny weather we have had over the past few weeks. The weeds and grass seem to be doing particularly well. In terms of vegetables, we have potatoes, onions, cabbages (although the pigeons seem to have had these), cauliflower, broccoli (the pigeons like these too), sweet corn and some leeks. We haven’t attempted to grow anything in this soil before, so it will be interesting to see how the vegetables do this year. We have also planted out some tomato plants in grow bags. While there are a couple of plants in the polytunnel, we have put the rest against the wall outside my study. This gets a fair amount of sun, particularly in the afternoon, and having tomato plants both inside and outside will hopefully spread the harvesting season. We will have to see. We have only planted from the other side of the piece of wood down towards the end wall. We haven’t got around to clearing the last patch. I guess we will as we start to need the space. All I can say, is that they must be desperate! 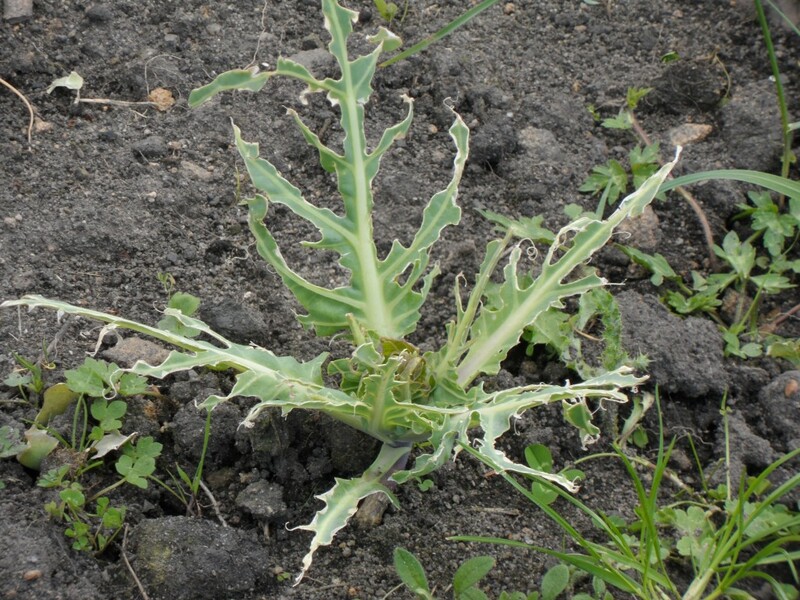 MMmm….without exception, the pigeons have managed to munch their way through all the cabbages that I planted. They are probably so fat they can barely fly!